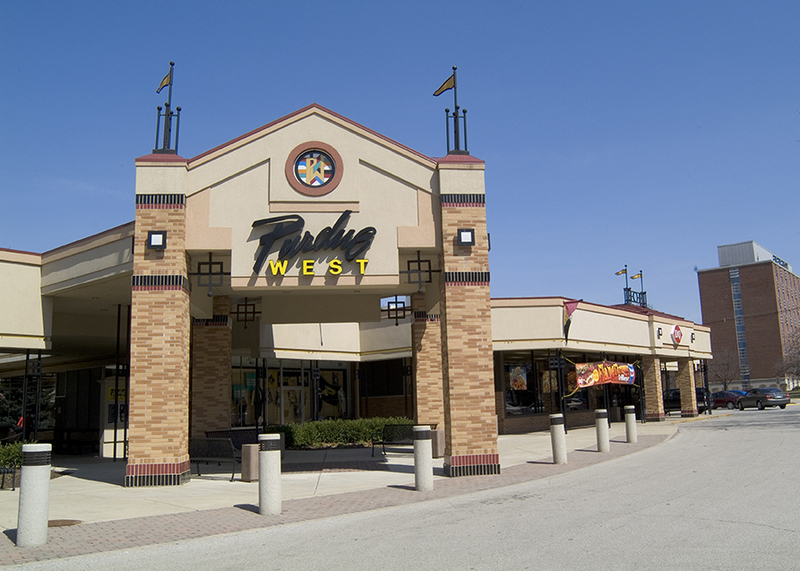 Purdue West, a Purdue Research Foundation-owned and -managed shopping center located on the west edge of Purdue University's main campus, is ideally located to meet the shopping needs of university students, faculty and staff in addition to West Lafayette residents. Purdue West sits at the corner of State St. and McCormick Road, within easy walking distance of Purdue University residence halls as well as Purdue Village (formerly Purdue's Married Student Housing). The shopping center also features ample parking. Approximately 12 shops and restaurants are located in Purdue West. For more information regarding available retail space at Purdue West, contact David Hodde, Director of Real Estate, Purdue Research Foundation Office of Real Estate, at 765-588-3470. Resident population of approximately 11,400 within Purdue West's primary trade area. 38 percent of Purdue's on-campus population lives within a quarter mile radius of Purdue West. More than 20,000 visitors utilize the nearby Purdue residence halls during summer camps and conferences. Thousands of additional visitors are drawn to the campus for athletic events, convocations and guest lectures. Tippecanoe County population: 131,000+, with plenty of growth just north and west of Purdue West.